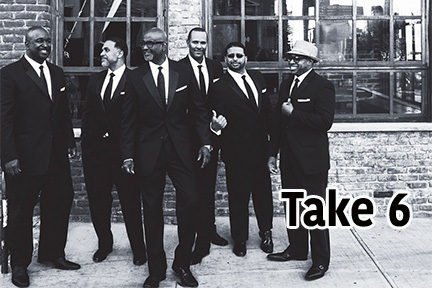 TAKE 6 is the most awarded a cappella group in history, with ten Grammy’s, ten Dove Awards (Gospel Music Awards), Best Jazz Vocal Group honors for seven consecutive years in Downbeat’s prestigious Reader’s and Critic’s Poll, a Soul Train Music Award, BRE (Black Radio Exclusive) Vocal Group of the Year, two NAACP Image Award nominations, induction into the Gospel Music Hall of Fame and countless other musical and humanitarian citations. Showing the global appeal of this phenomenal group, they celebrated their 25th Anniversary last year with a World Tour including stronghold favorite markets Asia, South America, eastern and western Europe and the United States and TAKE 6 opened up new markets with debut tours of Australia and Canada. They receive rave reviews and overwhelming audience reception wherever they go. From New York’s famed Blue Note to the Montreux Jazz Festival, from PBS to ABC-TV specials, they remain the quintessential and pre-eminent a capella group in the world, working harder than ever, and loving every minute of it.